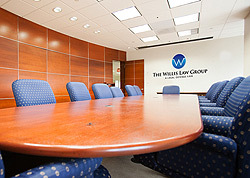 The Willis Law Group provides large firm expertise with small firm personal service. Our philosophy is unique because we put our clients first. Even though we have a team of experienced trial lawyers with proven success records, we listen to our clients and determine the corporate needs and structure before we define our defense strategy. We believe in proficiency, results, and cost-effectiveness. We put the client first and we get the job done. Every client is unique. Every case is unique. 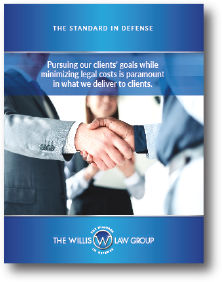 The Willis Law Group provides seasoned attorneys experienced in relevant practice areas to lead our clients' cases and to help get them better results. We achieve this by 1) Asking the right questions; 2) Listening to your answers; 3) Identifying your objectives; 4) Probing all of the issues; 5) Getting the facts; and 6) Working with the client and related parties effectively. 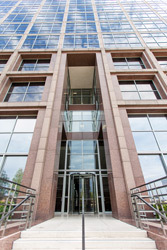 As experienced trial attorneys, we are confident when facing courtroom litigation. However, we also understand that the best result isn't always achieved in the courtroom. We work to resolve disputes before going to court. The Willis Law Group's team of knowledgeable attorneys understands the ever-changing, precedent-setting, and continually-evolving legislation that makes up our legal system. This understanding and our experience enables us to quickly determine whether to resolve a case in a conference room or a courtroom. Our litigation approach is highly-targeted. We call it the "Precision Litigation™" approach to defense work rather than the “shotgun” approach employed by many of our competitors. We don’t believe in unnecessary depositions and creating an avalanche of paperwork to overwhelm our opponents. Knowledge and experience enable us to quickly identify and target the essential aspects of a case for effective resolution in the matters entrusted to us by our clients. We strive to become your legal partner for your case today, and your trusted counsel in the years to come. Customer satisfaction involves more than one favorable outcome, and a positive working relationship is a critical component of long-term confidence and trust. Our goal is to help you accomplish your objectives and to move this process forward as effectively and quickly as possible. We are responsive to our clients' needs and prioritize communication regarding progress and strategy. Our objective is to secure positive results for our clients. Take the first steps and learn more about The Willis Law Group and how we can help you achieve your legal objectives. 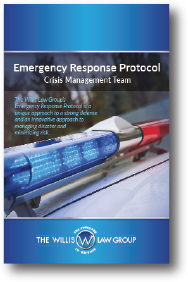 The Willis Law Group's Emergency Response Protocol equips you with the strategy and resources to establish a strong defense.